The idea of energy-efficient lighting appeals to most homeowners, but many people don't have the time to research and understand all the complexity out there when it comes to finding the most energy-efficient and environmentally responsible lighting systems. 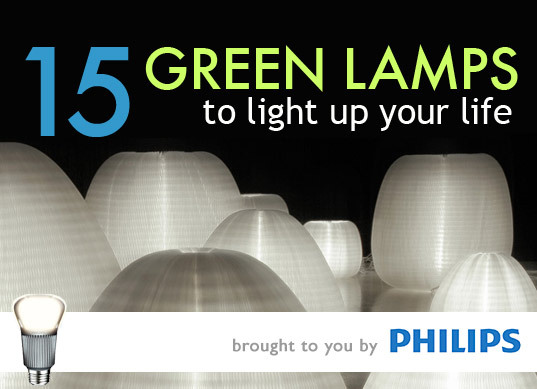 That's why Inhabitat is here to help in our Green Lighting 101 editorial series (which is generously sponsored by Philips). So far in our Green Lighting 101 series we've showcased the state-of-the-art in energy-efficient lighting tech and shared 6 green lighting tips to help cut down your energy bill - but what about the actual lamps fixtures that bring green energy technology to light? There's a million ways to make a lamp - but all lamps are not suited to the same purposes, nor are they all made from eco-friendly materials or able to illuminate with energy-efficient light. With this in mind, we've rounded up the 15 most innovative, interesting eco-friendly lamps that bathe your home in low-energy light - read on for our top picks to suit any lighting situation! Task lighting is a specific type of directional lighting that is focuses illumination upon a specific area where a task needs to be performed. Task lighting should not be used to replace overall lighting needs, but rather to complement or fill the void of existing lighting. 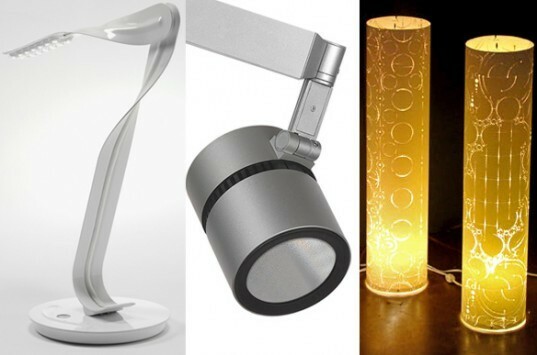 Task lighting typically comes in the form of table and desk lamps, clamp-type flexible arm lamps, book lights, and for the more adventurous, headlights. Ambient lighting is designed to illuminate an entire room in a uniform and low-key manner. Ambient lighting should never be harsh on the eyes — it should create a comfortable environment that accommodates basic lighting needs. 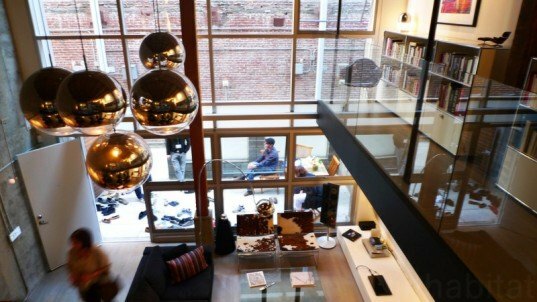 Popular lighting solutions for achieving this type of illumination include floor lamps, chandeliers, hanging lamps with low-watt bulbs, or hanging lamps filtered by cylindrical shades. The Bic ballpoint is an iconic writing utensil that has been honored by the MOMA for its refined utilitarian design – so imagine the attention that this recycled pen chandelier will draw in your home! Each brilliant recycled chandelier is designed by En Pieza using hundreds of Bic Crystal pens that refract and disperse light from within. You can also step up this chandelier’s eco cred by popping in an energy-efficient CFL or LED bulb. 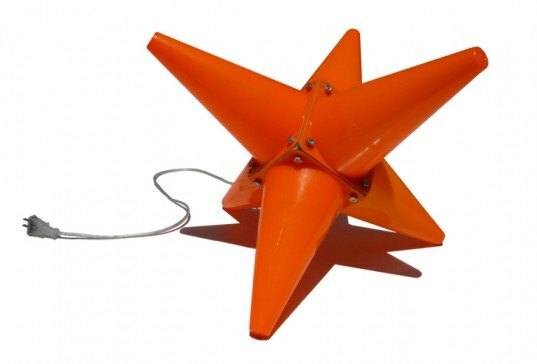 It’s hard to believe that Sarah Turner‘s brilliant starburst pendant lamps start out as a bunch of plain plastic bottles! The UK-based designer sandblasts old coke bottles, carefully cuts them into ribbon-like shapes, and then assembles them into orbital lanterns. Each elegant pendant lamp can be lit with a CFL or low-energy LED bulb. 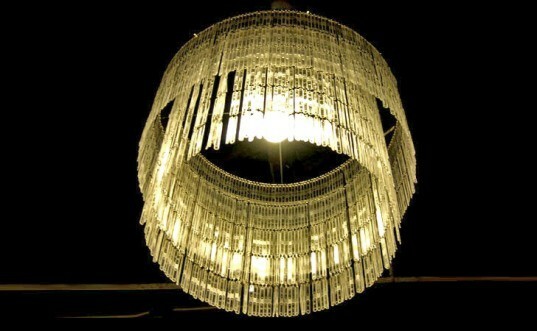 Luis Teixeira‘s elegant recycled chandeliers are composed of cast-off clothes hangers fanned out in a circular array. We love how each unique hanging lamp lights up with a sparkling gleam that rivals the finest crystal chandeliers. 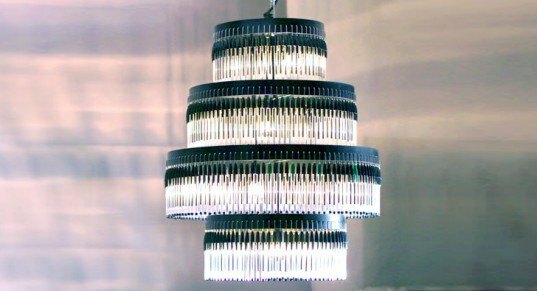 We love seeing innovative new uses for everyday materials, so we flipped our tops when we spotted this Pop Pendant Light painstakingly crafted from soda can pull tabs by Mauricio Affonso. Like a disco ball or punched tin lamp, the 15″ sphere casts a beautiful array of light beams and shadows when illuminated from within by an energy-efficient bulb. Throwaway plastic coffee stirrers are a tremendous source of waste that plagues cafés around the world. Capitalizing on the way that plastic mimics the light-refracting properties of crystal, Studio Verissimo transformed hundreds of single-use stirrers into a stunning translucent chandelier! 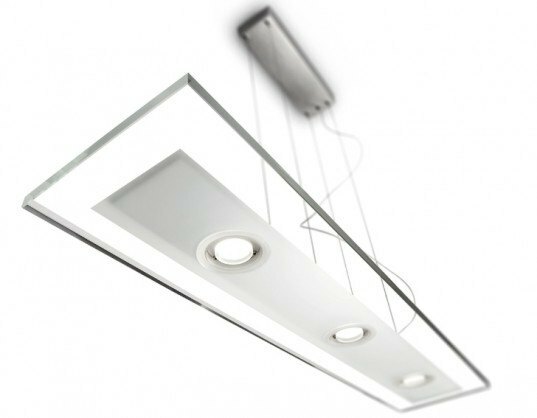 Philips’ Ledino Suspension Light is a streamlined fixture that consists of a single strip of glass fused with brushed aluminum and three 7.5W LED lights. The fixture boasts a lighter-than air aesthetic that complements any interior space, and its array of dimmable LED lights can emit four different shades of light — from warm white to cool white. Molo’s brilliant flat-pack Urchin Softlights start out as condensed reams of craft paper – but they unfurl into beautiful hexagonal honeycomb forms. Simply install a CFL or low-energy LED bulb and these cloud-like lamps will lend a warm, enchanting ambience to any room. This clever cone lamp by Laura Haaker is constructed from 6 connected traffic cones that expand outwards in a brilliant burst of color. This funky floor lamp can be easily outfitted with an energy-efficient LED or CFL bulb to add a dose of urban flare to any space. Although it was initially released in 2006, Yves Béhar’s Leaf Lamp continues to set the standard for energy-efficient task lighting. The desk lamp consists of two beautifully-sculpted strands of aluminum that are highly recyclable and keep material use to a minimum. 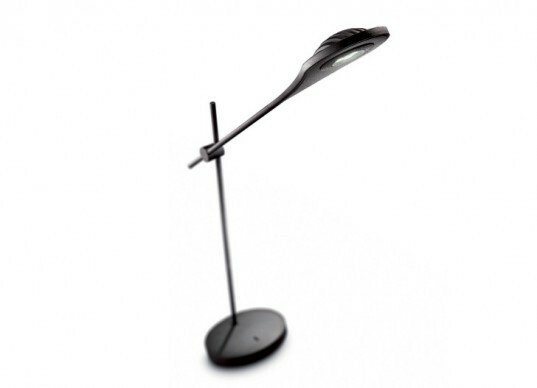 The adjustable arm bristles with 20 bright LEDs, and a set of touch-sensitive controls at the lamp’s base allows for easy adjustment of light intensity. 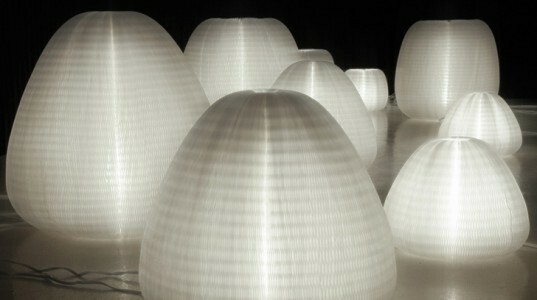 The entire lamp is made of 37% recycled materials and is 95% recyclable. Koncept’s svelte Equo lamp benefits from a pared-down profile that is as easy on the eyes as the light it sheds. A set of 28 bright white LEDs consume just 6 watts of energy, and a counterbalanced arm makes adjustments a snap. 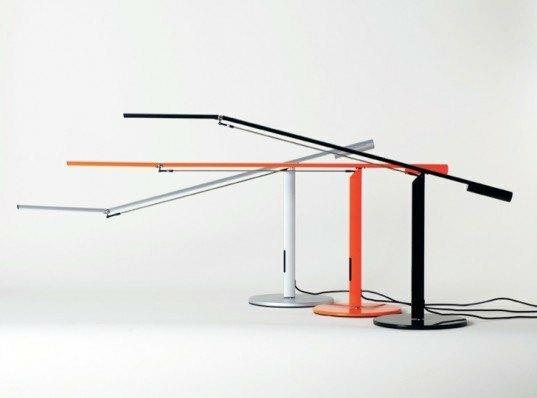 This minimalist Ledino Desk Lamp by Philips packs a powerful LED light source and a lighter-than-air aesthetic. Its streamlined aluminum arm can be easily adjusted into any position, and its warm white light source is rated to last for 20 years of use. 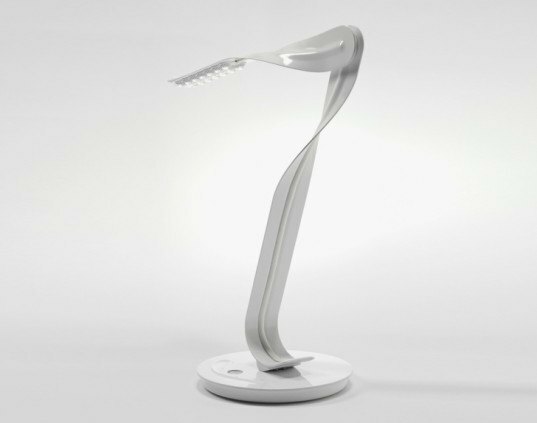 This streamlined Seagull LED lamp by QisDesign takes off with a lyrical design reminiscent of a bird in flight. The pared-down light improves upon conventional task lamps with a dual-panel design that can be easily adjusted to suit a wide range of lighting needs. Ruth Oh transforms everyday paper postage tubes into elegant cylindrical table lamps by simply slicing away sections of carboard. They’re designed to use energy-efficient bulbs like LEDs or CFLs which run at cooler temperatures than incandescents. 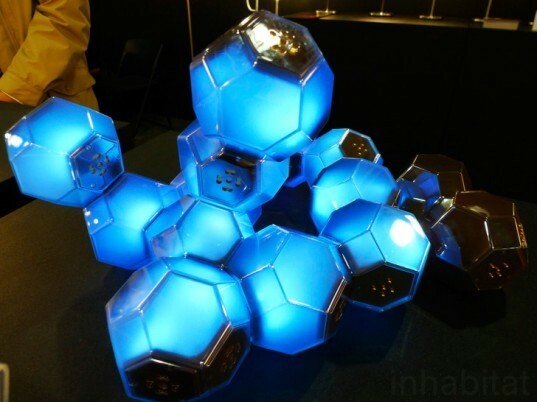 Designed by QisDesign, the Crystal Light consists of a series of modular icosahedron LED blocks that snap together to form practically any shape. This gorgeous glowing table lamp can be also configured to light up in an array of colors and patterns – perfect for setting the mood in any interior space. Philips’ Ledino Table Light is a versatile lighting solution that makes a great centerpiece for any room. The space-saving compact lamp is illuminated by a 3 LEDS that can cast either a directional spot light or a diffused lighting effect for at least 20,000 hours. When it comes to lighting your home, there are a few little technicalities to consider — but thankfully they’re easy. Lets start with bedrooms, which are actually one of the easiest areas to light in your home. For general lighting you have three options: a flush-mounted fixture, a semi-flush mounted fixture, or a chandelier. Chandeliers can only be used if the bottom of the chandelier is at least 6 feet from the ground — more space is preferable unless it’s directly over a bed, in which case no one will be hitting their heads on it. The question of flush-mount vs semi-flush mount is also simple — the advantage to having a semi-flush is that light bounces of your ceiling, so you get more illumination for your buck — but of course it also depends on your style. Supplement your general lighting with table lamps for good ambient lighting, and remember these table lamps aren’t for reading — lower wattage is great here! You can save energy with lower-watt lights that are gentler on your eyes if you need to turn them on in the middle of the night. If you do read in bed, purchasing a task light instead of a table lamp could be a great idea to maximize the light when reading and save your eyes from straining. In general floor lamps can also be used in bedrooms that do not have power in their ceilings. In this is the case the best thing to do is to look for a torchiere-style floor lamp which typically uses a high watt fluorescent to shine light at your ceiling so it can reflect and light the room. 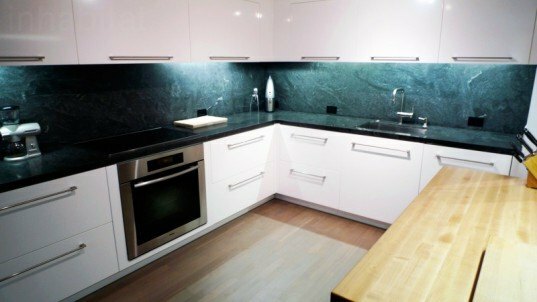 As for the kitchen, pendant lamps look great over counters/islands/peninsulas and provide good light for cooking. Just remember to mount your pendants about 32-34 inches from the top of the counter. If the island is very narrow or isn’t a sit-down island, around 36 inches is the sweet spot. Determining the light size is simple — most pendants categorized as mini-pendants will do just fine for islands that are not very large. Just take into account how many pendants you would like, and space them out as symmetrically as possible for the best results. The next part of lighting your kitchen or dining room that many people find frustrating is putting a chandelier over a table — just how big should that chandelier be? Well, there is a simple formula that will fix the frustration — take the shortest width of the table if it’s rectangular (or if it’s round then take the circumference), divide it by two, and then add a couple inches. For instance if you have a 48 inch table, you would use a 24-26 inch wide chandelier. The same rule for hanging pendants applies for chandeliers as well — mount it about 32-34 inches above the table, depending on the style of the chandelier. Take all these helpful tips and combine them with some of these green lighting options below to have your home look and function beautifully. Philips has always been at the forefront of green thinking and design innovation. They’re a leading innovator of lighting technology that saves energy, carbon and offers a higher quality of light so that we can all enjoy a greener future. Their recently released A19 AmbientLED maintains a light output of 800 lumens, while using just 20% of the energy consumed by a standard incandescent bulb. All of their green products reduce costs, energy consumption and CO2 emissions. They offer a significant environmental improvement in one or more of our green focal areas: energy efficiency, packaging, hazardous substances, weight, recycling and disposal, and lifetime reliability. Purchase the 12.5W AmbientLED bulb at any Home Depot location or by visiting them online here. Lets get the cost down on those LEDS!! It appears that there is a "get the old ones off the shelves" attitude with regard to this money saving technology. Why are these bulbs still in the $20-$30 dollar range. This discourages sales and keeps them out of the hands of those who could use the break on their power bill. Use the example of the new auto plant in michigan that uses solar energy for manufacturing power. This plant also uses plenty of robotics (solar powered robots? who whudda thunk it). This is a tremendous way to compete with the Chinese labor cost and export our products. When you said circumference, I think you meant diameter. 1/2 the circumference (plus a few inches) of a round table would have the chandelier overpowering the table. Essentially you are recommending a chandelier of slightly more than half the radius, maybe 55% of the table width. Wow! That Bic Pen chandelier would shed some light on my writing endeavors! Great post- very illuminating! 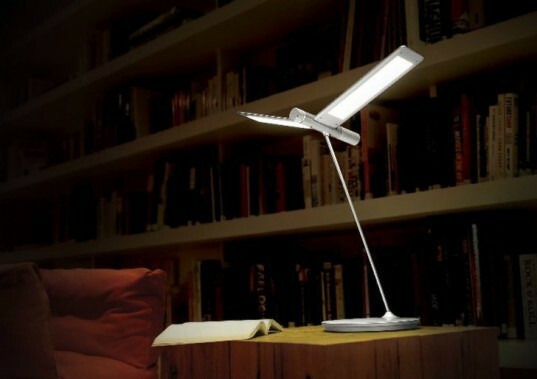 The Lendino Table lamp is some funky stuff- I really am finding out how much I dislike overhead lighting. I love that all of my apartment's overhead lights are on dimmer switches, and the light in my vestibule has a motion sensor. I need some of these lamps in my life! Recycled Coffee Stirrer Lamp by Studio Verissimo is pretty incredible. That must have been grueling work! Awesome lights! I think people often forget how much lighting enhance the look and feel of any room! The Bic Pen chandelier is my fave! I really love the etched yellow cylinder lights... they remind me of my favorite sculpture by Eva Hesse. Bic Pen Chandelier by En PiezaThe Bic ballpoint is an iconic writing utensil that has been honored by the MOMA for its refined utilitarian design - so imagine the attention that this recycled pen chandelier will draw in your home! Each brilliant recycled chandelier is designed by En Pieza using hundreds of Bic Crystal pens that refract and disperse light from within. You can also step up this chandelier's eco cred by popping in an energy-efficient CFL or LED bulb. 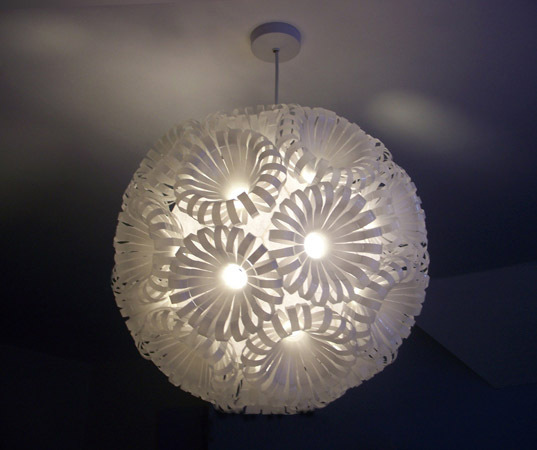 It's hard to believe that Sarah Turner's brilliant starburst pendant lamps start out as a bunch of plain plastic bottles! The UK-based designer sandblasts old coke bottles, carefully cuts them into ribbon-like shapes, and then assembles them into orbital lanterns. Each elegant pendant lamp can be lit with a CFL or low-energy LED bulb. Clothes Hanger Chandelier by Luis Teixeira Luis Teixeira's elegant recycled chandeliers are composed of cast-off clothes hangers fanned out in a circular array. We love how each unique hanging lamp lights up with a sparkling gleam that rivals the finest crystal chandeliers. Pop Pendant Light by Mauricio Affonso We love seeing innovative new uses for everyday materials, so we flipped our tops when we spotted this Pop Pendant Light painstakingly crafted from soda can pull tabs by Mauricio Affonso. Like a disco ball or punched tin lamp, the 15" sphere casts a beautiful array of light beams and shadows when illuminated from within by an energy-efficient bulb. Recycled Coffee Stirrer Lamp by Studio Verissimo Throwaway plastic coffee stirrers are a tremendous source of waste that plagues cafés around the world. Capitalizing on the way that plastic mimics the light-refracting properties of crystal, Studio Verissimo transformed hundreds of single-use stirrers into a stunning translucent chandelier! Philips Ledino Suspension Light Philips' Ledino Suspension Light is a streamlined fixture that consists of a single strip of glass fused with brushed aluminum and three 7.5W LED lights. The fixture boasts a lighter-than air aesthetic that complements any interior space, and its array of dimmable LED lights can emit four different shades of light -- from warm white to cool white. Philips' Ledino Suspension Light is a streamlined fixture that consists of a single strip of glass fused with brushed aluminum and three 7.5W LED lights. The fixture boasts a lighter-than air aesthetic that complements any interior space, and its array of dimmable LED lights can emit four different shades of light -- from warm white to cool white. Urchin Lamp by Molo Molo's brilliant flat-pack Urchin Softlights start out as condensed reams of craft paper - but they unfurl into beautiful hexagonal honeycomb forms. Simply install a CFL or low-energy LED bulb and these cloud-like lamps will lend a warm, enchanting ambience to any room. Molo's brilliant flat-pack Urchin Softlights start out as condensed reams of craft paper - but they unfurl into beautiful hexagonal honeycomb forms. Simply install a CFL or low-energy LED bulb and these cloud-like lamps will lend a warm, enchanting ambience to any room. Although it was initially released in 2006, Yves Béhar's Leaf Lamp continues to set the standard for energy-efficient task lighting. The desk lamp consists of two beautifully-sculpted strands of aluminum that are highly recyclable and keep material use to a minimum. The adjustable arm bristles with 20 bright LEDs, and a set of touch-sensitive controls at the lamp's base allows for easy adjustment of light intensity. 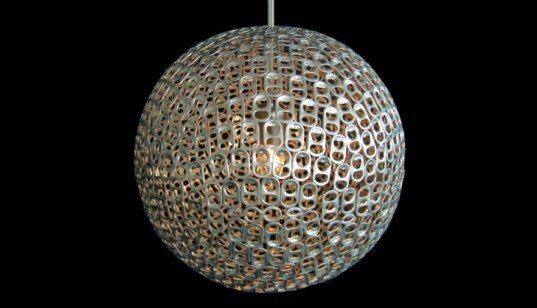 The entire lamp is made of 37% recycled materials and is 95% recyclable. Equo Desk Lamp by Koncept Koncept's svelte Equo lamp benefits from a pared-down profile that is as easy on the eyes as the light it sheds. A set of 28 bright white LEDs consume just 6 watts of energy, and a counterbalanced arm makes adjustments a snap. 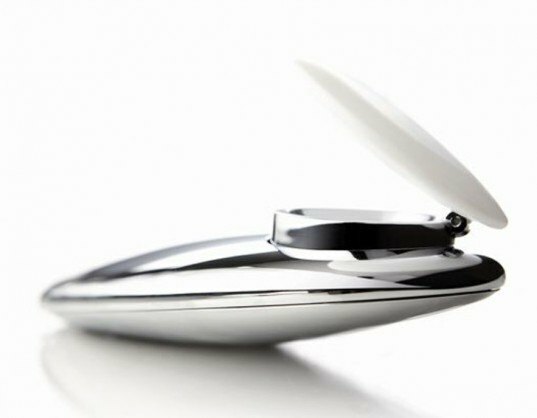 Seagull Light by QisDesign This streamlined Seagull LED lamp by QisDesign takes off with a lyrical design reminiscent of a bird in flight. The pared-down light improves upon conventional task lamps with a dual-panel design that can be easily adjusted to suit a wide range of lighting needs. 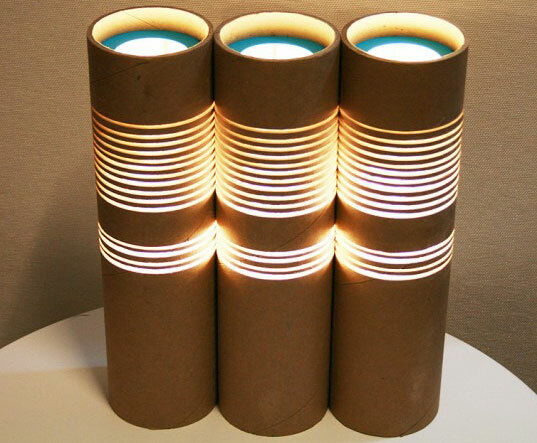 Paper Tube Light by Ruth Oh Ruth Oh transforms everyday paper postage tubes into elegant cylindrical table lamps by simply slicing away sections of carboard. They're designed to use energy-efficient bulbs like LEDs or CFLs which run at cooler temperatures than incandescents. Ruth Oh transforms everyday paper postage tubes into elegant cylindrical table lamps by simply slicing away sections of carboard. They're designed to use energy-efficient bulbs like LEDs or CFLs which run at cooler temperatures than incandescents. Crystal Lamp by QisDesign Designed by QisDesign, the Crystal Light consists of a series of modular icosahedron LED blocks that snap together to form practically any shape. This gorgeous glowing table lamp can be also configured to light up in an array of colors and patterns - perfect for setting the mood in any interior space. Ledino Table Light Philips' Ledino Table Light is a versatile lighting solution that makes a great centerpiece for any room. The space-saving compact lamp is illuminated by a 3 LEDS that can cast either a directional spot light or a diffused lighting effect for at least 20,000 hours. When it comes to lighting your home, there are a few little technicalities to consider -- but thankfully they're easy. Lets start with bedrooms, which are actually one of the easiest areas to light in your home. For general lighting you have three options: a flush-mounted fixture, a semi-flush mounted fixture, or a chandelier. Chandeliers can only be used if the bottom of the chandelier is at least 6 feet from the ground -- more space is preferable unless its directly over a bed, in which case no one will be hitting their heads on it. The question of flush-mount vs semi-flush mount is also simple -- the advantage to having a semi-flush is that light bounces of your ceiling, so you get more illumination for your buck -- but of course it also depends on your style. Supplement your general lighting with table lamps for good ambient lighting, and remember these table lamps aren't for reading -- lower wattage is great here! You can save energy with lower-watt lights that are gentler on your eyes if you need to turn them on in the middle of the night. If you do read in bed, purchasing a task light instead of a table lamp could be a great idea to maximize the light when reading and save your eyes from straining. In general floor lamps can also be used in bedrooms that do not have power in their ceilings. In this is the case the best thing to do is to look for a torchiere-style floor lamp which typically uses a high watt fluorescent to shine light at your ceiling so it can reflect and light the room. As for the kitchen, pendant lamps look great over counters/islands/peninsulas and provide good light for cooking. Just remember to mount your pendants about 32-34 inches from the top of the counter. If the island is very narrow or isn't a sit-down island, around 36 inches is the sweet spot. Determining the light size is simple -- most pendants categorized as mini-pendants will do just fine for islands that are not very large. Just take into account how many pendants you would like, and space them out as symmetrically as possible for the best results. The next part of lighting your kitchen or dining room that many people find frustrating is putting a chandelier over a table -- just how big should that chandelier be? Well, there is a simple formula that will fix the frustration -- take the shortest width of the table if it's rectangular (or if it's round then take the circumference), divide it by two, and then add a couple inches. 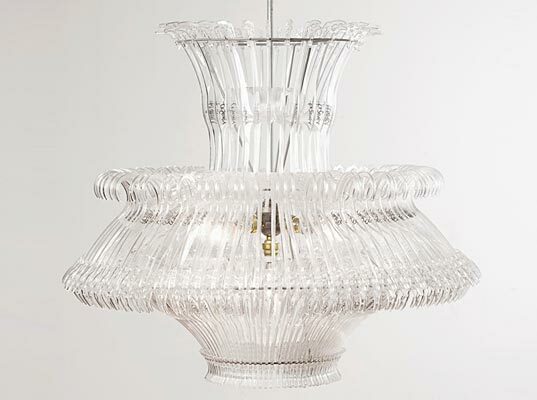 For instance if you have a 48 inch table, you would use a 24-26 inch wide chandelier. The same rule for hanging pendants applies for for chandeliers as well -- mount it about 32-34 inches above the table, depending on the style of the chandelier. Take all these helpful tips and combine them with some of these green lighting options below to have your home look and function beautifully. Ambient lighting is designed to illuminate an entire room in a uniform and low-key manner. Ambient lighting should never be harsh on the eyes -- it should create a comfortable environment that accommodates basic lighting needs. Popular lighting solutions for achieving this type of illumination include floor lamps, chandeliers, hanging lamps with low-watt bulbs, or hanging lamps filtered by cylindrical shades.